I knew Bill McIlhany and had visited his home on multiple occasions. He was a collecting friend. We were not extremely close but close enough to occasionally email each other and always take time to spend some time together at Collector’s Conventions. His passing was a sad day for me and all of those who knew him. His collection was vast and mainly apparatus and I knew there were many things I would be interested in to add to my own collection. With that in mind I booked my flight and prepared to head to Los Angeles for the two-day event. I reasoned that the amount of money I could possibly spend would more than cover the expense for the trip by avoiding the extra 5% buyer premium through the internet. Also by seeing the items I could possibly avoid some costly mistakes. I spent $30,000 at the auction so my reasoning was solid. I spent the weekend with my friend Mike Caveney. If you know Mike, he is not a big fan of 3-D items but he held in there with me for the three days of preview and auctions. Mike is a great guy and a good friend. It was good company for the weekend. On preview day Mike and I showed up just after the preview opened and it only lasted a few hours, so I went right to work looking at all of the things I had identified as possible acquisitions. All the items were not actually readily available which was a little disappointing but the folks at Owen were quick to go and find the items and bring it to you to examine. There were about 15-20 people at the preview which was about the same number who would show up at the auctions over the next two days. When the auction started it did not take any of us long to realize that there was a “500-pound gorilla” on the phone who was buying many of the choice lots and many of the lots in general. Bidder number 25 rang out clearly and consistently as the winner of about 30-40% (just guessing) of the auctions the first day. I was very lucky on several of the items I purchased as the phone bidder did take some breaks along the way. Here are the items I was able to win for my collection and the amount I paid without premium. 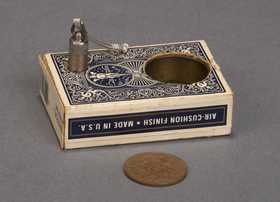 #53 vanishing bird box- a beautiful die box effect where the die is replaced by a bird in cage. Always wanted this rare prop and this one was very nice. I considered it a market price buy at $850. #58-Coin dropper deck. This was magnificent with the work reminiscent of Jon Martin. It functioned perfectly. It is similar to Collectors Workshop Coin Classic, but the workmanship is unsurpassed. A sleeper at $250. Should have been $800. #86- Ink producing ladle- this was a nice old prop but was not on my list of items to buy. When this happens I usually regret it and that is the case with this. Not quite as nice as the photo on the screen showed and I slightly overpaid at $425. $350 would have been about right. #100 Coin ladder This was the main item on my list of wants. I could not believe it when the “gorilla” phone bidder was not on the line for this one. I felt it was a $10,000 item and I won it for a $9,000 bid. I was thrilled as I always wanted this prop and this one was a beauty which I had examined the day before to insure it was all intact. It was a great example of this classic old and very rare prop. #229 Willman Divination Box- This was a beauty. It was one of the nicest I have ever seen. The inlay fantastic and simple a beautiful item built by a master craftsman I would say around the turn of the century. The hammer dropped at $750. It was about half of what I feel the value is. I thought it was one of my best buys. That was it for day one. I did buy a number of other items, but these were the key ones going into my collection. From the beginning the same Phone Bidder was back on the line with a new bidder number this day. #20 Watch Target by J. Bland-Nice item at a great price. Tole painted pre-1900 prop. Very nice and a great buy at $325. #30 Pillar of the Magi- This was right up there with the coin ladder for me. I wanted it and was willing to take a stand on it. I love this effect and have owned a few of them but I felt this one was the best one I had ever seen. It was not old but built by master craftsman John Gaughan. I had drooled over the photo of it in the Albo Book and now was my chance to own it. More importantly the phone bidder was not involved with this one, so I had a shot! The hammer dropped at $5,400 and it was mine. There is a postscript to this story so keep reading if you want to know more about this. #53 Himber Cash on Demand- I had never collected money makers until I purchased the Terry Harris Collection. He had one of the largest money maker collections around (over 70) and I decide to keep it intact so since then I have added about 10 more money making devices to the collection and this was one of them at a reasonable price. #151 P&L Club Size Bogart Tube- Much rarer than the bigger stage size. It is a pretty scarce item that I purchased for $700. About right for the item. 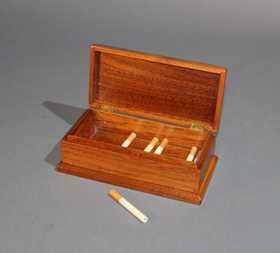 #105 Thayer Cigarette Catching Extra Ordinary- I have a lot of Thayer props but did not have this one. Probably overpaid a little at $550. 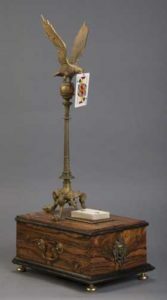 #181- Thayer billiard ball stand- Another item I did not own. It was advertised as the rare green version, but examination shows what I believe to be just a repainted prop. Maybe slightly overpaid $1300 (we all make mistakes). I purchased a number of other items, but these are the main ones. While I don’t like to be controversial, I did have a few issues with how the auction was conducted. First of all, and probably my main issue, was the length of the auction. Each item auctioned was excruciatingly long. We literally waited for a phone bid to come in from the internet for up to 30 seconds before the auction was closed. It was painful to be there, so I cannot imagine how the people watching at home felt. Almost eight hours for 300 items was bordering on exasperating. Day two was slightly better than day one but slightly is the key word. My other big complaint was this: on at least 4 occasions the auctioneer said sold and called out my bidder number as the winner only to reopen the auction because a very late internet bid would come in. This became very discouraging and on all of those occasions I dropped my bid and did not bid again. The comment was “We have to get Bobbi all the money we can”. I fully agree, it is the auctioneers job to get the client the most money possible and I wanted this auction to be extremely successful for Bobbi. She is a great lady and deserved that. I am just not sure that purpose was served by all of the delay and discontent the process caused. I was not the only bidder this happened to. It happened a lot. There was one gentleman there from overseas that it happened to regularly. I felt sorry for him. He did visibly express his discontent a few times as did I.
I feel the consignor would have been better served by conducting a timely auction. It does not take long to train the bidders to bid and that includes internet bidders. 30 seconds of dead time waiting on a bid is to long. Opening up bids repeatedly after the hammer drops is not a good way to run an action in my opinion. Again, just my opinion. I am not a professional auctioneer and I certainly cannot argue with the results which were at least market value and some of the “outliers” were really high. I just think the same sales dollar could have been achieved with a timelier approach. I am sure some bidders at home left for commitments late in the auction since it unexpectedly ran over so long (if they did not fall asleep in the process). This has been voiced in other blogs and chat sites, so I am quite sure I am not alone. 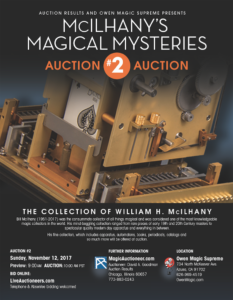 I did decide just after this auction that I would not return in person again and I was an internet watcher on November 12th when the second auction was held. Not necessarily because of the above but because of the one day auctions being held instead of the initial two day. Thank goodness for friends. When I began looking at my items post auction, the Pillar of the Magi was behind a rope saying do not touch. Now I am sure the auction staff would have let me look at it if I had asked but it looked good to me and I made the bid. Now that it was mine and paid for I turned it around and found the back was missing and that the internal batteries were corroded from years of neglect. My heart sank as I had just paid $6,500 for this item. A voice from behind me said “That isn’t going to work” and I turned around to find my good friend Johnny Gaughan standing behind me. Without me saying a word Johnny said, “Bring it by my shop in the morning and we will fix it for you”. Wow is it good to have friends! I am happy to report it is intact and functioning perfectly. The folks at Owen were fantastic in the checkout process. There were two items I had recorded as winning that they did not have me winning but quickly and efficiently cleared that up and awarded me the items. I was checked out and paid for within ½ hour of the auction. The packaging and shipping of my items was done professionally and at surprising reasonable cost. All eight boxes arrived in good shape and again the packaging superb. Alexia was particularly helpful in the whole process. She may be the bosses daughter, but they are lucky to have her there! 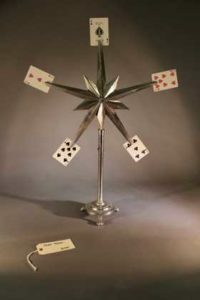 #137 Martinka Card Star- Got this for an incredible price of $1,000. A sleeper! #200 Talking Skull- this was advertised as German 1930. 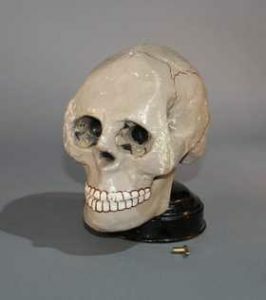 It is actually a Jess Thornton Talking skull from Abbott’s circa 1947. If it is in good condition and working, it was a good buy at $800. Should be double that. 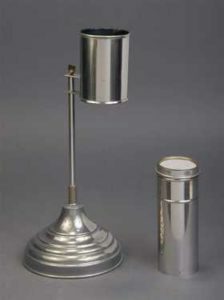 It sold for $95 in 1947 and recently sold at auction for $1500. Prices were strong again although there were some really goods buys to be had as in the first auction. My guess the same bidder as the first auction acquired many of the lots. The auction seems slow but maybe not quite as slow as the first one. Below are photos of some of the additional items I won for my collection.